21.21 is a low-voltage arrangement of 21 raw porcelain pendants, each draped over an inverted, sandblasted borosilicate glass diffuser that houses either a 20-watt xenon or 1.5-watt LED lamp. 21.21 uses headphone jack connections, which allow the pendants to be “plugged into” the canopy for fast and easy installation. Pendant lengths are pre-set during production and are not site adjustable. The white, powder-coated rectangular canopy is 33.5" / 850 mm long, 11.2" / 284 mm wide, and 2" / 53 mm deep. 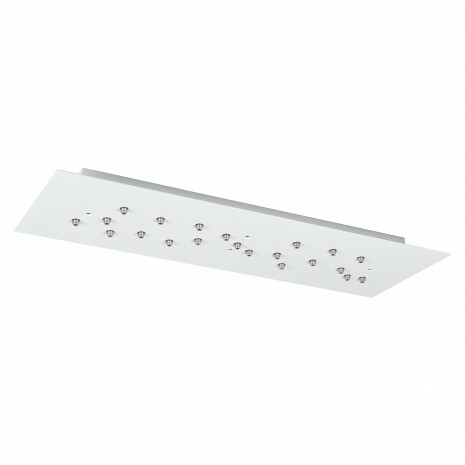 The canopy is surface-mounted and does not fasten directly to a junction box. Join our mailing list for exclusive offers and event invitations.